Istanbul won the Kennerspiel des Jahres in 2014 and was one of my favorite games that year, coming in just behind Splendor, as a smart yet fast-moving game that combined worker placement and set collection mechanics with a novel pathfinding aspect that particularly rewarded players who could plan ahead and see non-obvious ways to make their moves more efficient. The base game includes sixteen place tiles that can be arranged in numerous ways to form a 4×4 board, so that the paths required to score can vary in each game. There are two regular expansions that can make the board larger and the game longer by adding resources or other ways to obtain rubies, of which a player must be the first to get a certain number to win the game. Since one of the big rages in board game publishing is to extend popular brands via dice and/or card game versions, it’s not a surprise to see Istanbul get this treatment with the new Istanbul: The Dice Game (Das Würfelspiel, for purists), which retains most of the theme of the original game and some of its concepts, but completely does away with the most interesting part of the base game—the pathfinding. The result is a totally different game, one that’s fun but very light, more luck-driven, and doesn’t do enough to distinguish itself from other Euro games with a substantial amount of chance. In Istanbul: The Dice Game, players are once again trying to obtain rubies, six for a 2-3 player game or five for a 4-player game, from a central board where the cost to get rubies from each source increases every time someone purchases or takes one. 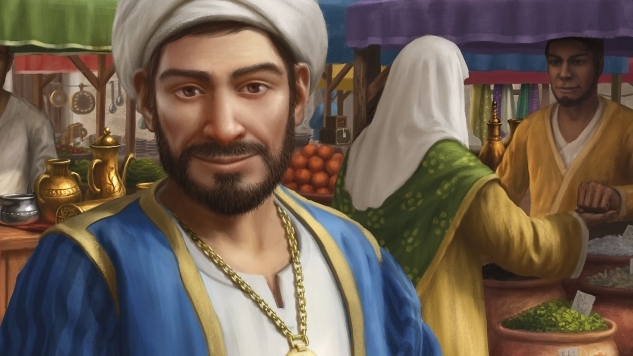 You can buy a ruby with coins (lira); with a set of at least four goods of one color; with a set of four goods, one of each color, and an increasing number of additional goods; or by buying five mosque tiles (four in a four-player game) from the supply. There are four standard goods plus brown goods that function as wilds and can be used to substitute for any color. The dice allow players to gain resources—goods, lira or bonus cards—and can be rerolled if the player has a crystal to discard. Each player rolls five identical dice, which have four sides showing a goods type, one showing two lira, and one showing a bonus card. You can then take two actions based on the dice and whatever else you might have. For example, if you roll the same goods color on two dice, you can then take one such goods token from the supply; if you roll three different goods, you can take a brown token; if you roll all four goods types, you can take any two tokens of your choice. Each die showing lira is worth two coins if you choose to use it. You can draw as many bonus cards as you have dice showing that symbol, but you can only pick one of the ones you draw and then play it; all bonus cards offer you some benefit, and some cards then offer other players a related but lesser benefit. The other actions involve getting stuff from the board. You can obtain rubies in the ways I mentioned above, combining dice showing goods and goods tokens from your supply as needed. You can also buy mosque tiles for three or four goods, and thus gain additional abilities for the remainder of the game, some of which are very powerful, like the tile granting you an extra die every time you roll. Other tiles give you a benefit at the start of each turn—more lira, a third action, a crystal, a free bonus card—or a specific good every time you use the “take lira” action from your dice. Thus each turn presents the player with a set of decisions of whether to gain stuff now or to try to build up abilities so future turns are more powerful, which is more prevalent here than in the original game, where you could gain extra abilities from mosque tiles but adding more than two of them was usually too expensive. You have to balance the two areas, because if you focus too much on building an engine, another player can try to brute-force her way to buying rubies as quickly as possible while the prices are low (not that my daughter has done that to me … twice). Istanbul: The Dice Game is fun, which ultimately is the most important question around a game. It plays fast, it does require some thinking, and the luck factor is mitigated by other parts of the game like the fact that you don’t need all five dice to go your way or that you can spend a crystal and re-roll as many dice as you’d like. It plays two to four players, takes a half hour at most, and the absence of the pathfinding aspect means that it’s easier for younger players. For players with a little more experience on tabletop, though, it’s not a substitute for the original title.